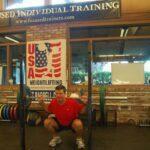 Nothing better than pain free squats! Results: #1 – Back pain has been reduced to rare, if ever! #2 – He did lose some body fat along the way….as evident by his belt fitting 3 holes smaller than before! #3 – Overall fitness level has gone through the roof in comparison to where he started and he is now able to make it through an entire workout at a higher intensity in conjunction with completing at home “homework” workouts. Likes: Buying voodoo dolls of coach Rob and putting as many pins in them as possible! Key’s to Brad’s success: He has been dedicated to completing his core work both during and outside of his personal training sessions. 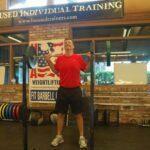 Brad has remained motivated by his decrease in pain and increase in mobility. Brad joined us last year with a long history of back pain. He had seen Chris Reed with Agile earlier in the year and was told even though he had a very slight disc degeneration it was nothing that would stop his from getting into better shape!!! When I first started working with Brad, he was extremely de-conditioned and after a few basic exercises I knew that most of pain would decrease with some general body strength. He didn’t have any limitations of movement ad was pretty flexible for someone who has not worked out since high school and is 6’3. I quite often remind Brad how far he has come in such a sort period that during our first workout he was unable to stand up from a BWS. He recently back squatted 40kg for 2×10. Brad is an avid golfer, but was unable to play as he was into much pain. He has been extremely committed doing his prescribed core work to strength his trunk as well as over time increasing his movements on his home workouts with BWS and push ups, just to name a few. In the last few months Brad has been playing golf again but still taking Advil pain meds get round the course. He has been making great strides in the gym with his fitness and strength and this past week played a full 18 holes of golf without any pain meds before, during or after the round.